Reminder: Aeroplan Devalues December 15th! Aeroplan is one of my favourite programs, because for quite a long time it has always had the best award redemption values to Europe in business and first class. This will change on December 15th, when Aeroplan devalues their award chart. If you don’t have enough Aeroplan miles, remember that American Express transfers instantly at a 1:1 ratio to Aeroplan, so the 25,000 points signup bonus from the American Express Gold Card or the 40,000 points signup bonus from the American Express Small Business Gold Card will come in really handy. You may have a chance for the points to post if you signup today, although it’s going to be really tight. It’s likely however with co-branded cards such as the TD Aeroplan Visa Infinite that the points from that card won’t post in time. This will be the last month to redeem miles at the lower levels, so I’d recommend you to definitely redeem an award if you’ve been saving up. I thought I’d quickly go over potential redemptions and award rules for anyone who might never have maximized an Aeroplan award before. What Awards Should I Be Booking? From North America, there are three main devaluations – Europe 1/2, Southern South America, and intra-Asia. The most expensive award chart levels, Asia 1/2, Indian Subcontinent, Africa, and South Pacific do not. I’ve written about why I find Aeroplan to be so useful, and it still will be, to an extent. 70,000 miles for Lufthansa First Class is still not bad, especially compared to 87,000 with Lifemiles and 110,000 with United. However, it’s no longer market leading, which is unfortunate. 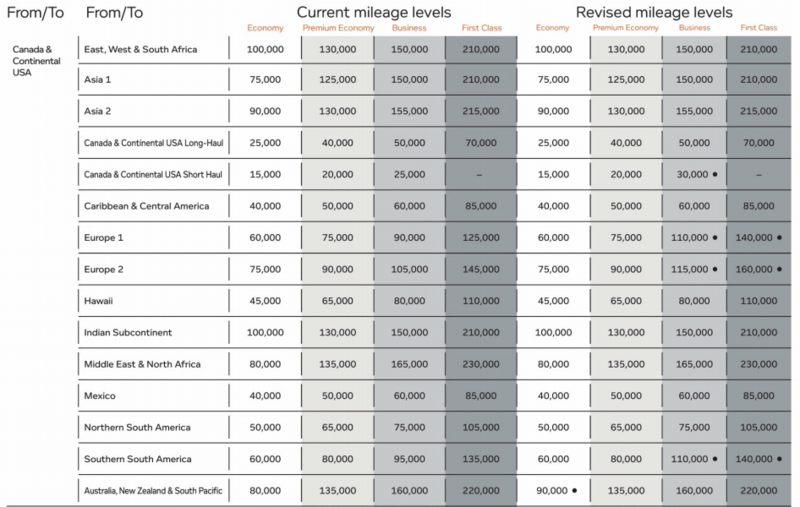 However, I would strongly recommend booking a Europe 1 business class award, which is currently 90,000 miles, or first class award, currently 125,000, which rises to 110,000 and 140,000 miles respectively after December 15th. I’m certainly looking forward to trying out Scandinavian’s new business class sometime in the next 12 months. To my knowledge, changes after December 15 that would not have required additional miles previously will require additional miles. That means routing changes within the same zones would be allowed. If you are changing the destination from Europe 1 to Europe 2, or from business to first, then it’s likely that additional miles would be required. Aeroplan uses a zone-based award chart, and an MPM based routing system. This means when redeeming an award from Point A (e.g Toronto) to Point B (e.g. Paris) the miles and connections you fly cannot exceed a certain number. Unfortunately, this number is only known by Aeroplan agents, and you can call to validate a potential routing. Flyertalk has a list of MPM between certain city pairs that have been found out by other members. You are permitted two stopovers, or one stopover and one open jaw in addition to your destination. This has to be booked via the call center, as the online pricing tool will only allow you a maximum of one stopover. There are certain carriers where you will incur fuel surcharges in the hundreds of dollars – you want to avoid those, which include Lufthansa, Asiana, Thai, as well as Air Canada. You can see a complete list of airlines which don’t have a fuel surcharge on my page here. The best way to look for award space is to use either KVS Tool (paid) or Award.Flights (free). Alternatively, you can search segment by segment on the ANA, United, or Aeroplan site. Unfortunately, award devaluations do occur, and they’re quite unpleasant most of the time. An alternative program that I am considering switching to is Alaska Airlines, since their award charts are still quite reasonable. The MBNA Alaska Airlines Mastercard does offer 25,000 miles as a signup bonus, and you can purchase miles with up to a 50% bonus for quite a reasonable price, so that’s likely something I will be focusing on in the future. Will you be redeeming your miles before December 15th? Alaska Airline does not have any *A Partners, where will u park your miles for *A flights? I’ve never done too many Canadian transcons, surprisingly, but likely I’ll collect SQ miles along with AC. Maybe spg amex can be used for that purpose. I’m new to this whole points system, but I’m just letting them rack up for a rainy day. I have no future travel plans but I’m just wondering what to do with my Amex points and aeroplan points. I have 55,000 Amex points and 42,000 Aeroplan points. Should I convert my Amex to Aeroplan? Does anyone know what either points plan will get me? Please help I’m so new to this and the more I read into it the more confused I get. Just a brief pointer – AMEX converts to Aeroplan at a 1:1 ratio. That means if you convert 48000, you’ll end up with 90,000 Aeroplan – good for a trip to Europe in business class if you book before Dec 15. Thanks for the Fuel-surcharge link…. I guess we can assume that these charges will come down now that the price of oil has plummeted, right? Yeah, right!! What a huge scam it is…..